April 16, 2019: On June 2-5, 2019, the inaugural “ColorUp” Digital Printing Boot Camp will be hosted by Color Ink, Inc. at their headquarters in Sussex, WI. The event will showcase a variety of digital printing and finishing platforms in a “real world” production environment to help industry professionals learn about digital production print and show them how to profitably sell it in the marketplace. Some of the most progressive vendors and suppliers in the digital print market have stepped forward to sponsor and actively participate in the event. This includes FujiFilm, Komori, Agfa, Zund USA, Konica Minolta, MGI, Neenah Paper and North American Plastics. Several Printing Industries of America Affiliates also are partnering organizations, including the Florida Graphics Alliance, Great Lakes Graphics Association, Graphic Arts Association, PIA MidAmerica, Printing Industries Alliance and Printing Industries Midwest. Todd Meissner explains, “There are a lot of misconceptions about digital printing technologies of today. We are really excited to share our experience and knowledge with other industry professionals to help accelerate the growth of digital printing in our industry”. Although it seems counter-intuitive to share knowledge with potential competitors, Meissner goes on to explain, “if our employees, customers and industry peers have a common belief in the technology, it will open up tremendous opportunity for all of us to increase our profits and grow sales. It may even revolutionize how print is sold and purchased. To learn more about the event, visit www.colorupinc.com. April 4, 2019: The Sustainable Green Printing Partnership (SGP), the leading authority in sustainable printing certifications for print manufacturers, has announced the Great Lakes Graphics Association (GLGA) as its newest resource partner. The association joins a growing list of leading brands and organizations that support sustainable printing initiatives. GLGA is heavily involved with the partnership between the Wisconsin Department of Natural Resources and the printing industry in the Midwest. Through this effort, GLGA has been able to promote a greater interest in both SGP as well as Green Tier, a program through the Wisconsin Department of Natural Resources that supports efforts to improve the green bottom line in different companies across the state. Please use this address for payments, registrations and Graphics Excellence Awards shipments. The addresses for our offices in Illinois and Indiana are unchanged. Our former toll-free number is no longer in service. August 30, 2018 – GLGA’s three state golf outings – our most popular networking events – saw their most successful summer yet. 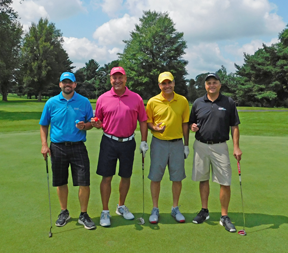 Almost 450 golfers and dinner guests attended the three outings, with two of the outings sold out and the third seeing a 25+ percent increase in the attendance over the previous year’s outing. Golfers enjoyed beautiful weather at all three outings this year. It was three fun days of sunshine, great courses, fantastic food, and prizes. Thank you to all of the players, dinner-only guests, sponsors, and prize donors for making the 2018 outings so superb! January 16, 2018 – PRINT United LLC reports that 10 independent regional and state affiliates of Printing Industries of America, serving commercial printing markets, have agreed to promote the launch of the PRINT United Expo to their members. The new trade show, which is co-owned and co-produced by the Specialty Graphic Imaging Association and NAPCO Media, will launch in Dallas in October 2019 and will give print service providers new ways to address changes to the printing marketplace. PRINT United will be promoted by the Great Lakes Graphics Association, the Graphic Arts Association, Printing & Imaging Association of MidAmerica, Printing Industries Alliance, Printing Industries Association of San Diego, Printing Industries Association, Inc. of Southern California, Printing Industries of Ohio and N. Kentucky, Printing Industry Association of the South, Inc., Printing & Imaging Association of Georgia, and Visual Media Alliance. SGIA will retire the SGIA Expo following this year’s event in Las Vegas in October 2018. Excitement is building as special activities are being planned for the final show, and the PIA affiliates are encouraging their members to attend. In addition to finding relevance in the convergence of markets, the associations recognize the importance of the technologies that will be on display at PRINT United. As such, their support will begin this year with the 2018 SGIA Expo. For a related story about the partnership to create PRINT United, please click here. December 8, 2017 – The Great Lakes Graphics Association, the Midwest’s largest and best-known print trade association, has announced the launch of a new video series designed to attract workers to the printing and graphic communications industry. GLGA produced the series to promote the career opportunities available to young, enterprising individuals and to make students, teachers, parents and guidance staff in schools aware that the printing industry offers good paying jobs that support personal growth. “Our members tell us that their number one need is finding talented candidates to hire for positions in all departments throughout their companies,” said Joseph Lyman, GLGA president. “Our industry provides career-oriented positions that offer financial security, opportunity for advancement, and the chance to learn new skills and work with cutting-edge technology.” Yet, too often GLGA’s members find themselves fighting outdated stereotypes about the industry. GLGA’s new videos will help members fight for talent. The position will provide for a long and rewarding career. The career is both high-tech and high-touch. Other young people are entering the industry. The career will provide for a family wage. The career will provide opportunities for advancement. The first video in the series features interviews with “Rising Stars” – young professionals who currently work in the industry. The first video may be viewed at https://glga.info/career-opportunities-in-the-print-industry/ . The second video will promote the high-tech/high-touch aspect of creating the products and services the industry offers. The third video will address the positive impact print has on the State of Wisconsin and its economy. These videos also will be posted on the GLGA website at glga.info. August 30, 2017 – Profitability continues to be the biggest challenge impacting companies in the printing industry. Forget about sales. Great sales just make your company an attractive target for acquisition if your probability isn’t large enough to purchase new equipment, to attract the best talent, or to make the changes necessary to compete in the marketplace. This is why we have created a Dynamic Ratios Calculator to provide you with a resource that will help you quickly understand how your company is performing financially. The Dynamic Ratios Calculator allows you to compare yourself versus others based on information you provide. All you need is four numbers – annual sales, income before taxes, number of full-time equivalent employees and your annual substrate costs – and you will quickly understand whether you are a market leader, market challenger or market laggard. The formulas are all based on information derived from Printing Industries of America annual Dynamic Ratios Study and have been widely accepted as key indicators regardless of what type of process you use or type of product you manufacture. Whether you are a printer, finisher, bindery, packager, tag/label manufacturer or converter, the Dynamic Ratio Calculator is for you. What if you aren’t a market leader? Participate in the PIA’s Financial Performance Assessment. It is a great way for you to taker a deeper dive into how you can become more profitable. Check it out the Dynamic Ratios Calculator today by visiting www.glga.info/drc. July 6, 2017 – After a hard fought legislative session, the Graphic Arts sales tax exemption has finally been restored! The credit is now PERMANENT and exempt from automatic sunset laws. Due to our efforts in Springfield the Graphic Arts sales tax exemption became part of the Manufacturing Machinery & Equipment exemption effective July 1, 2017. This is a HUGE win for all GLGA members. June 22, 2017 – The 2017 Print & Packaging Legislative Summit took Capitol Hill by storm on June 20 and June 21. More than 50 representatives of the print and packaging industry took their message to the lawmakers in Washington, DC. This year’s agenda called for greater emphasis on topics such as workforce development, tax reform, smarter regulation, postal reform, and health care reform. 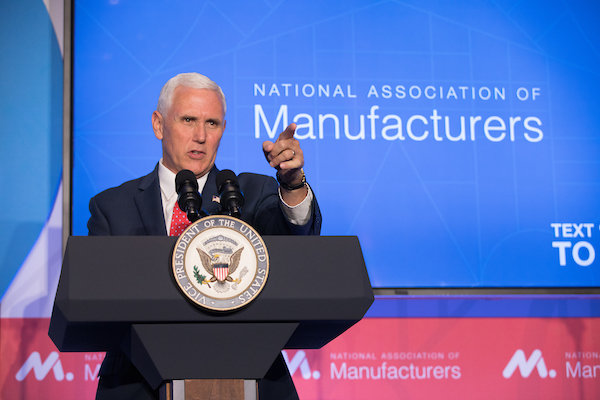 The Summit kicked off with a partner luncheon with the National Association of Manufacturers (NAM), Vice President Mike Pence, and Speaker of the House Paul Ryan (R-WI). “American manufacturing is roaring again” was the message the Vice President conveyed throughout his remarks while Speaker Ryan honed in on the need for tax reform to ease the financial burden placed on business owners. 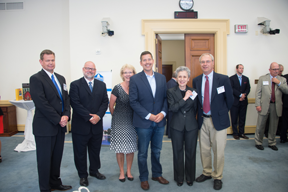 That evening, attendees again gathered at the Rayburn Building for a reception which included US Rep. Sean Duffy (R-WI), who spoke about how important paper and print/packaging is to Wisconsin’s economy. During his remarks, Representative Duffy reaffirmed his commitment to working to passing pro-business legislation that will keep the industry strong. 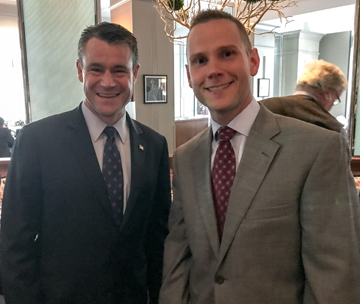 After the reception, attendees met with special guest US Sen. Todd Young (R-IN), who spoke about the need for healthcare and tax reform. Wednesday morning started bright and early at the NAM breakfast with Secretary of Labor Alex Acosta. The Secretary shared his vision for closing the skills gap and re-introducing apprenticeships in the workplace.